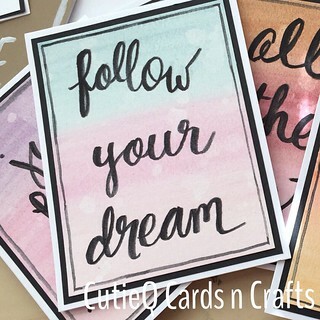 The Etsy shop – Cardmaking | Living life in the carpool lane..
For the many years that my Etsy store had been open, I struggled with how to manage inventory. I think I’ve finally figured out my own system. I will be working on becoming a “ready to sell” card shop. It’s much easier than making greeting cards on demand. No one wants to wait for a card. They want to order the card with minimal processing and wait time. I will be making four copies of every card I make and then I will make it available in the store for purchase. There will only be four copies of the card for sale. Once all four cards sell, then it’s gone. If a design is popular enough, I will create it again and restock the store. It’s a great way for me to see what sells and what doesn’t. To check out what I have in the shop, visit CutieQ Cards n Crafts on Etsy now!